On September 1st 1996, ISO 14001 was published, worldwide. Written over five years in consultation with international industrial experts, non-governmental organizations and regulators, this environmental management systems standard will help organizations manage their impacts on the environment, no matter what their size, nature or location. The implications for the future are enormous. But what does the standard mean in the real world? What changes do managers have to make to accommodate its principles? What decisions need to be faced and when? Is it really going to make a difference or is it just another case of global greenwash? Will it be another missed opportunity for you, your organisation, or your market? At the start of what promises to be a worldwide explosion of interest in standardised EMSs, ISO 14001 and Beyond looks at their creation, their use, and their limitations, attempting to discover the essential truth about this important management tool and where it will take industry. ISO 14001 and Beyond assembles the leading thinkers and practitioners in the field to record their thoughts and experiences on the new standard, its advantages and disadvantages. The book is designed to provide the reader with enough information with which to form an opinion on the future, and how that will influence subsequent actions. It also provides reassurance that, although the problems are real, so are the solutions. 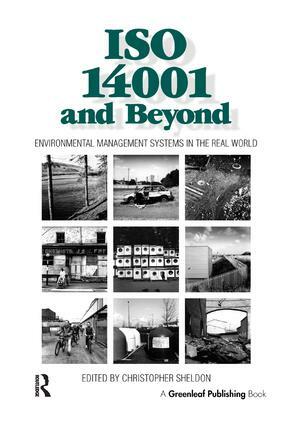 ISO 14001 and Beyond gives you the opportunity to read what some of the best minds have made of the standard so far and what they think lies ahead. There are reports covering a global spectrum of concern: from the US, Russia, Japan, Canada, Germany, the UK, and more; from multinationals, small- and medium-sized enterprises, local government, universities and professional bodies. All this material is gathered together in one book to give you the best, most meaningful information for the crucial decisions that you will need to make in the coming months.